Taipei, Aug. 10 (CNA) Over 100 former and active alternative military service members cleared trash from Yanliao Beach in northern Taiwan on Friday, in an activity organized by the New Taipei Department of Civil Affairs. 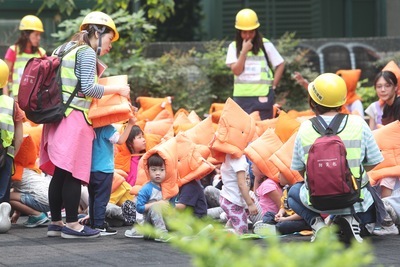 The event, which took place in the city's Gongliao District, was held to raise public awareness of the coastal environment and problem of marine debris. Wang Li-ying (王立穎), who volunteered in the cleanup campaign, said he wanted to contribute his time to help preserve marine life and a clean beach environment. A former member of the alternative military service, Wang said he learned about the activity from an old colleague in the service, who is currently working at the city's Legal Affairs Department. According to the department, the 20 large sacks of garbage collected Friday included discarded fishing nets, garbage bags and plastic bottles, all of which are hazardous to marine life.